In a cycle of 154 14-line poems first published in 1609, William Shakespeare meditated on the themes of love, death, and desire. During 2016 the Bodleian Library is collecting newly printed copies of each of Shakespeare’s sonnets, in particular seeking examples from hand-press printers worldwide made in this, the 400th year since Shakespeare's death. The Old School Press is contributing sonnet 11. 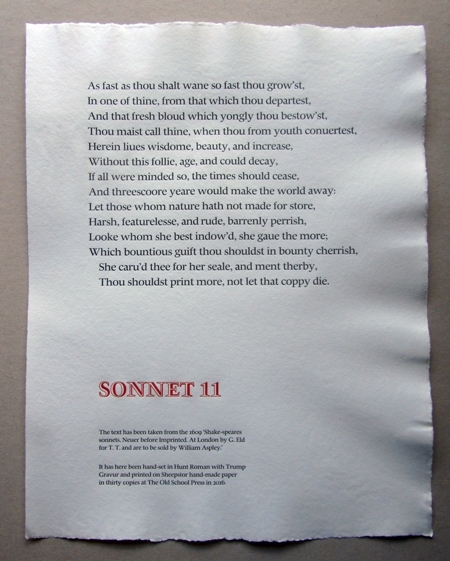 When the request first went out, inviting presses to 'bag' a sonnet, I searched the text of them all for the word 'print' and found just one - sonnet 11. So that was duly bagged! It finishes with the line 'Thou shouldst print more, not let that coppy die.' Perfect. In the early 1990s we visited paper-maker Tim Powell at his mill on the edge of Dartmoor which he called Sheepstor Craft Mill after a local tor. You can watch an early video of Tim and colleague Ian O'Casey at work here; it was taken before he moved to his house and mill on Roborough Down which was where we met him. As I remember, he was winding down at the time and principally made paper for water-colourists but I bought two quantities from him, one of which we used for our book Venice Visited in 1999. This project seemed a good opportunity to use some of the second batch and I have halved some sheets from it, giving a printed sheet about 43cm by 33cm (about 17in by 13in). Initially I had expected to have to damp the paper - it has a smooth sized surface - but I tried one sheet dry and it worked perfectly - much labour thereby saved! It also felt the right moment to pull out the case of 24pt Hunt Roman for the sonnet, and that of 14pt for the caption. I've combined the Hunt with the 48pt Trump Gravur before - I like how they go together. And of course a second colour for the title. After copies for the Bodleian, our archive, and a project with the Oxford Guild of Printers, we shall have a few left over which we are offering for £25 each plus p&p. You will find a higher-definition image on our website by following the 'posters' button on the left of the home page. You can see the full list of sonnets and who will be printing them on the Bodleian's site here. This has been very well received, the de luxe copies in particular selling well. Comments back from buyers have included 'a terrific achievement', 'lovely, 'beautiful typesetting, excellent printing', 'a considerable achievement of scholarship and production', 'wonderful binding and printing', 'an impressive work'. We collected some type from our typesetter Stan Lane last week. He is now about half way through the setting of volume II, having dealt with all the footnotes first. Making up pages from the main text and the footnotes is no trivial matter, and having the footnotes ready makes the job easier. Our plan is to bring the type back to our studio this time, so the book will be printed on the Western proof press. This will probably mean tackling it 48 pages at a time. We shall need more racking in our store for the paper and the printed sheets as they come off the press. An edition of 250 copies of a book of around 170pp is a mammoth affair for a small outfit. The plan is to be able to publish the book in 2017, with volume III - which is already written - coming along in the following year. 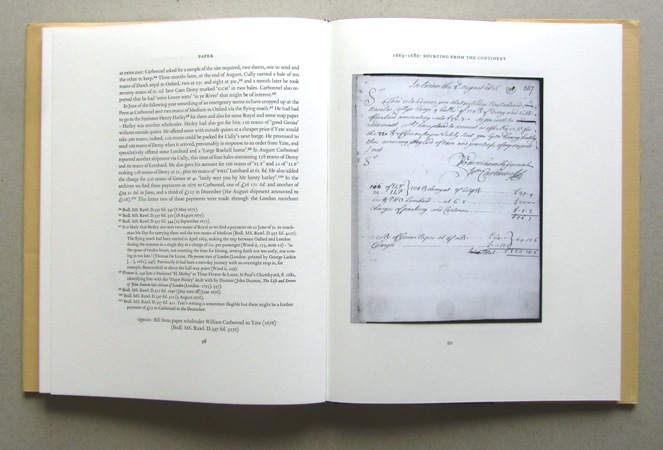 Each copy will contain sixteen photographs of contemporary documents and five photographs of extant punches and matrices. Over the last five years I have been buying in badly damaged copies of books from the period; typically the catalogue will say 'lacking boards and back strip', or 'the first 25pp badly stained', or 'all illustrations removed'. Copies of the de luxe edition will additionally contain a collection of leaves or sections from books covering each decade of the period concerned, in particular illustrating the use of Arabic, Hebrew, and Greek. This way I shall give those otherwise dead copies a useful second life. We have missed this splendid event for the last two years because of our house move, one way and another. So we look forward to taking part again with a table of printing, and hoping for good weather. Our house move has prompted me to take a long hard look at our type holding and the need to reduce it to the type I am likely to use (again). One of my tasks for this summer is to go through everything with the target of downsizing by upwards of fifty cases of type. I shall be advertising them beforehand and will probably take smaller founts to Whittington and to the OGP wayzgoose (see below) as well as anything people reserve beforehand. Wheatley Campus of Oxford Brookes University. This feels like a long way off but it's good to get it in the diary sooner rather than later.